See William Chueh present his work at our EmTech conference. While doing his doctoral studies at Caltech, William Chueh showed that heat from the sun can turn cerium oxide—a relatively cheap material—into an effective catalyst for splitting water to yield hydrogen that can be used to make fuel. Most other hydrogen extraction processes rely on expensive catalysts made from precious metals such as platinum. “There’s simply not enough of those metals to make a dent in our fuel needs,” says Chueh, who is now a materials scientist at Stanford University. 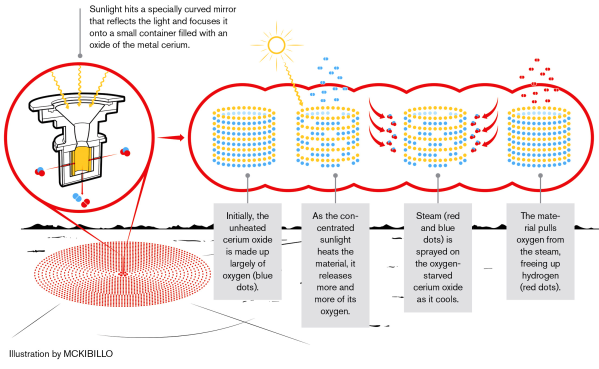 His process relies on mirrors of the type that some solar plants use to concentrate sunlight by a factor of 1,500. The sunlight heats the cerium oxide to 1,500 °C, driving out its oxygen. As the cerium oxide cools, steam is fed to it, which then gives up its oxygen to the oxygen-starved material, freeing hydrogen gas. The hydrogen can be collected, and the cerium oxide can be reheated to repeat the process. Chueh has used the same process to split carbon dioxide. The resulting carbon monoxide can be combined with the generated hydrogen to make hydrocarbon fuel such as methane—a renewable alternative to extracting it from the earth. The technique generates about 100 times more carbon monoxide than previous processes for a given amount of energy. Chueh’s idea is to use his catalyst in combination with the type of large solar concentrators now used in power generation. Meanwhile, he’s working to make cerium oxide–based hydrogen generation work at lower temperatures, because the only containers that can hold the material at 1,500 °C without melting are made of exotic alloys that cost too much. He’s already developed a hybrid of cerium oxide and another material that shows the potential to work at 500 °C, which would allow the use of stainless-steel vessels.